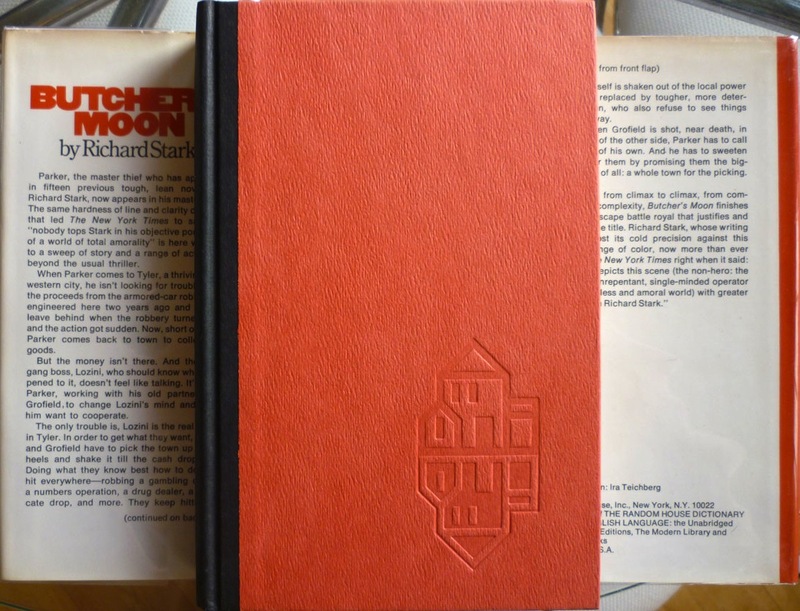 Having expounded at length – and how – on the meat (groan...) of Butcher's Moon – i.e. 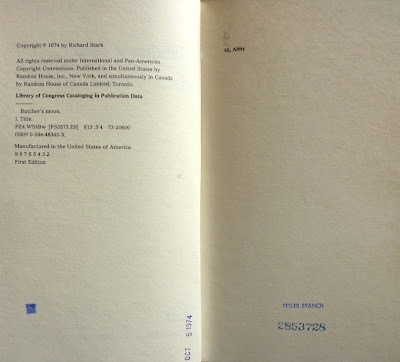 reviewing the novel itself – I thought I'd ruminate for a while on the American first edition of the book: its collectibility and current value, and how to identify a true first. 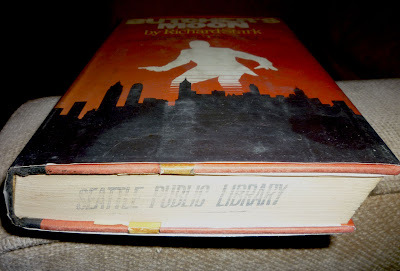 Those whose interest in tedious matters to do with book collecting is negligible should look away now. 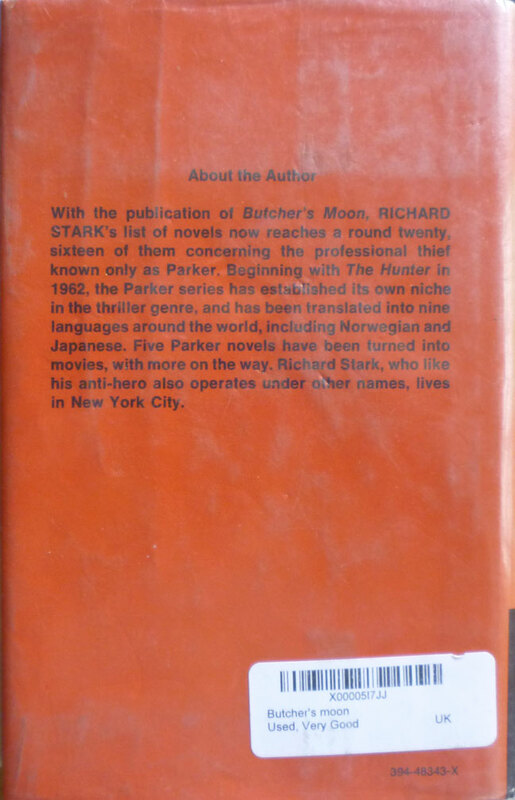 Consequently, Butcher's Moon was for a long time bloody difficult to get hold of, and for many Parker enthusiasts and collectors, their journey through the Parker novels came to an abrupt halt with the fourteenth book, Slayground (1971). (Comics writer and Parker fan Ed Brubaker mentions how hard it was to find copies of both Butcher's Moon and Plunder Squad towards the end of this Tom Spurgeon interview with Darwyn Cooke.) 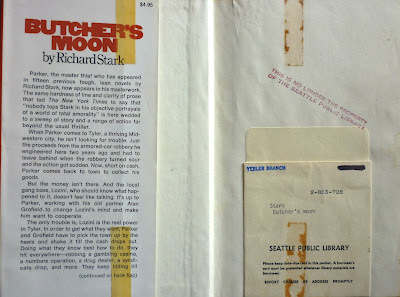 With the advent of the internet, eBay and aggregate bookseller sites like AbeBooks, Butcher's Moon became slightly more readily available, but copies of the book still remained out of reach for most folk unless they were prepared to part with a substantial sum, even for a tatty Avon paperback. 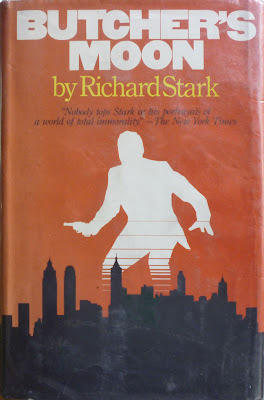 Of course, all that's changed now that the University of Chicago Press edition is out there. And the arrival of a new edition of the novel does appear to have affected prices of older editions – at least the Avon softcover: you can currently find copies of the Avon paperback on AbeBooks for around $20, although there are still some on the site for upwards of $75. 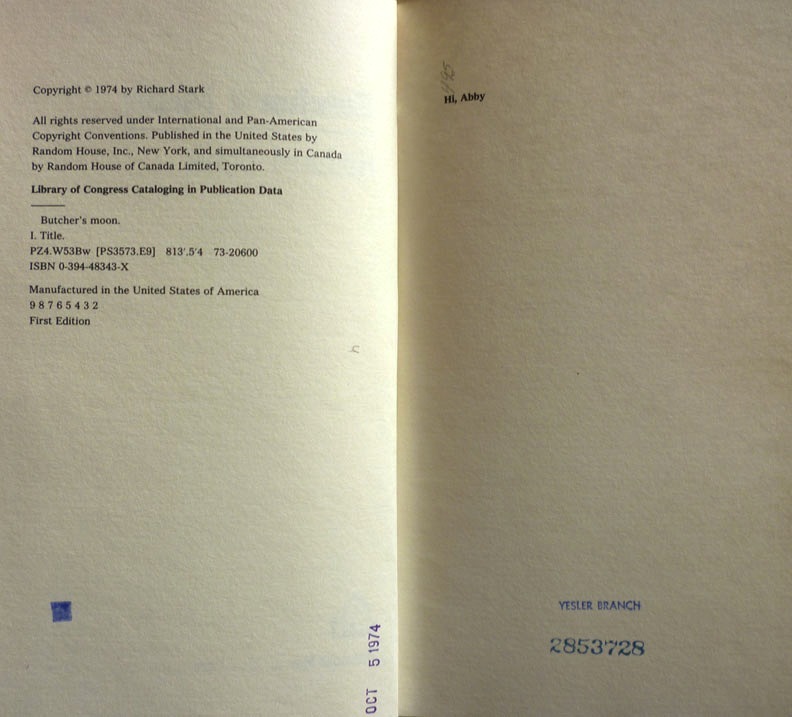 The Random House first edition, however, has pretty much held its value: there are a few copies on AbeBooks for under $100, but those will probably be ex-library; you'd still be looking at at least $200 for a very good-to-near fine copy of the first. Mind you, I'm not entirely convinced Butcher's Moon ever went into a second printing, so this may all be academic. 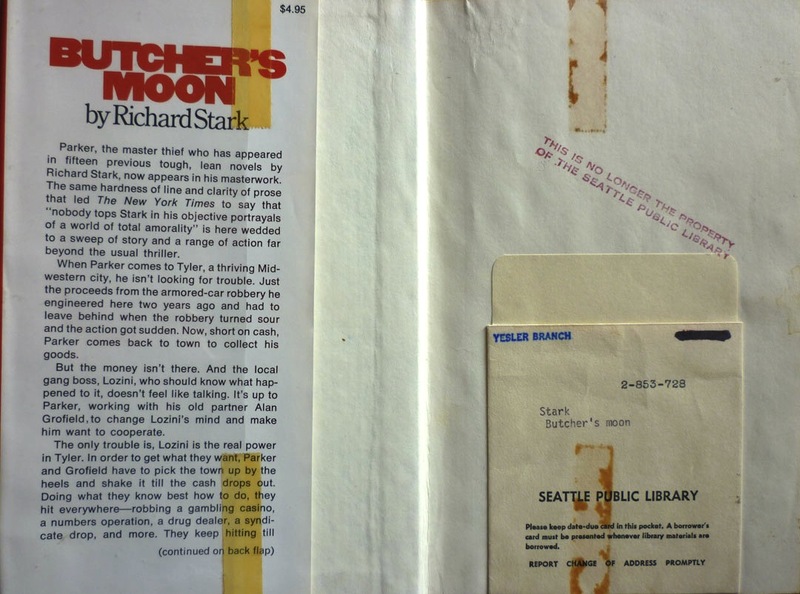 Oh, and, should you be interested, the dustjacket of the Random edition was designed by Ira Teichberg, other examples of whose work can be found in the AIGA Design Archives.